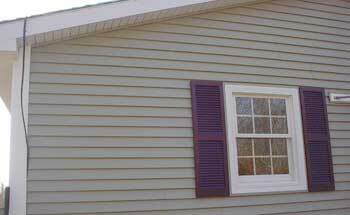 Wyeth Woodworking and Remodeling offers superior siding services. As the homeowner, your taste is reflected through the exterior design and siding you choose. Therefore, you will be able to see all the choices for home siding that exist, as well as the benefits and detriments to each choice. Wyeth works with many reputable suppliers and subcontractors in the southern New England area. As a full service siding company experienced in remodeling, we realize the important of adequate resources to satisfy a variety of customers and consumers. We are skilled in all areas of siding application from vinyl to wood paneling, aluminum, wood shingling and everything in between. While vinyl siding adds beauty to your home’s exterior, it is also low maintenance and accommodates the lifestyles so many individuals have. The last thing you want to worry about is the weather affecting your home and causing you unnecessary safety issues. In addition to selecting and applying your siding, Wyeth installs the best insulation for your home’s design, climate conditions and purpose. While offering the best advice, Wyeth takes the consumer concerns as priority while determining the most appropriate materials to use on and in your house.